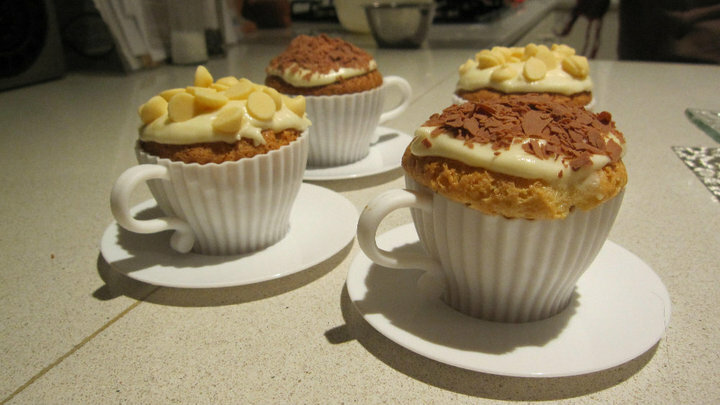 I have never been a huge fan of cupcakes, I usually find them quite bland and that the icing provides the only flavour. However at home bored one day I decided to do some baking. I found a gluten free cupcake recipe of which I had all of the ingredients for so gave it a go. The icing I used consisted of icing sugar, butter and hot water (see recipe below) and then sprinkled flake on the top of some and white chocolate chips on the rest. The cupcakes, if I may say so myself, were amazing – not only did they look good (baked in very cute teacupcake molds) – but they were very tasty, even my non gluten intolerant friends and family enjoyed them. The cupcakes are even tasty enough to eat without any icing. The recipe is from the book Gluten-Free Baking Classics, and you can find it on the site Cupcakes take the cake. Preheat oven to 180 C. Position rack in centre of oven. Place cupcake baking liners in a 12-cupcake baking pan. Beat sugar and eggs in large bowl of electric mixer at medium speed for one minute. Add flour, salt, baking powder, xanthan gum, oil, milk and vanilla; beat at medium speed for one minute. Pour batter into prepared pan. Place in centre of oven and bake for about 20 minutes or until centre springs back when touched and cupcakes are very lightly browned (bake about 35 minutes for nine-inch round, 40 minutes for eight-inch round). Cool on rack for five minutes. Remove cupcakes from pan onto rack and cool completely before icing. Top with your favourite frosting. Place a couple of tablespoons of icing sugar in a bowl with a slice of butter. Slowly add hot water ensuring you melt the butter and create an icing consitency. Add extra butter or icing sugar as required. What is your favourite cupcake icing? These cupcakes are amazing and so fluffy! They are delicious and i’m going to have to make some for any upcoming parties. Thansk for the recipe. What gorgeous looking cupcakes. I must try the recipe. Where did you get the gorgeous cupcake moulds?